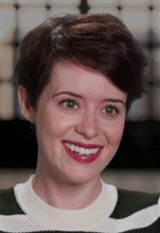 Born in Stockport, England, Claire Foy is the youngest of three children. Her parents divorced when she was eight, so she moved to Buckinghamshire with her mother, brother Robert and sister Gemma. When she was a child, Claire took ballet lessons, but at 13, she developed juvenile arthritis, which put a stop to any dreams of being a ballerina. She also had dreams of being an actor, and majored in drama and screen studies at Liverpool John Moores University, but didn't seriously consider pursuing a career in it until after university, when she enrolled in a one year course at the Oxford School of Drama, where she had the opportunity to appear in a number of plays. While at school Claire also took on a number of odd jobs, including working in a grocery store, putting tags in caps and providing security at Wimbledon. After graduating in 2007, Claire was cast in a 2008 episode of a new BBC TV series titled Being Human and played a guest role on the BBC series Doctors. She made her professional stage debut that same year at the Royal National Theatre in London, playing Jan in The Miracle. Her first on-screen starring role came when she was cast as Amy Dorrit in the BBC mini-series Little Dorrit opposite Matthew Macfadyen and Tom Courtenay. Her work on the show earned her a Best Actress nomination from the Royal Television Society. A role in the 2010 Sky One mini-series Going Postal was followed by a regular role as Lady Persephone Towyn on the popular series Upstairs Downstairs from 2010 to 2012. In the meantime, she made her major motion picture debut alongside Nicolas Cage in Season of the Witch (2011) and starred in two other mini-series: Channel 4's The Promise (2011) and BBC's White Heat (2012). In February 2013, she returned to the stage to star as Lady MacBeth opposite James McAvoy in the title role of the Shakespearean tragedy, MacBeth, at Trafalgar Studios 1 in London. However, it was her role as Anne Boleyn in the 2015 TV series Wolf Hall that garnered her the most attention and acclaim she'd had up to that point. For her work in the series, Claire received a 2016 BAFTA TV Award nomination for Best Leading Actress, a Best Supporting Actress nomination at the Critics’ Choice Television Awards, Best Actress in a Miniseries at the Satellite Awards, TV Movie/Mini Supporting Actress at the Gold Derby Awards and Best Actress – Long Fiction Program at the Festival de Television de Monte Carlo. In July 2015, four months after giving birth to her first child, Claire began filming the first season of the Netflix TV series The Crown, playing the starring role of Elizabeth. The series was an immediate hit when it hit the airwaves in 2016, and Claire's work was well-received. For her stellar work on the series, she won a Golden Globe and a Screen Actors Guild Award, as well as the British Artist of the Year award at the 2017 BAFTA/LA Britannia Awards. She also received nominations from the Primetime Emmy Awards and the BAFTA TV Awards, to name a few. Following the second season of the show, Claire passed on her role to Olivia Colman who will play the Queen in her middle-age. Most recently Claire appeared in the biographical drama First Man (2018) in which he starred opposite Ryan Gosling as Janet Armstrong, the wife of astronaut Neil Armstrong. She is also set to return to theaters in the film The Girl in the Spider's Web (2018) as Lisbeth Salander. Claire and her husband, Stephen Campbell Moore, announced their separation in February 2018 after four years of marriage. Together they have one daughter named Ivy Rose born in 2015.